For years I’ve watched the Poo Bahs of Higher Ed abandon their mission of helping humanity and instead debase higher education in exchange for growth. The Poo Bahs don’t want growth per se, they want the massive increases to pay they get for ruling larger institutions (truth be told, I suspect the reasons our politicians are pushing for massive immigration are much the same). One of the more recent choices to hurt higher education was to pursue Social Justice Warrior-work, to attract the mass of kids who got caught up in this violent, irrational craze, instead of focus on the real mission of higher education. The end result of this choice, beyond saddling a bunch of helpless kids with huge debts, has been protests and riots, violence that doesn’t seem to end no matter how much our spineless Poo Bahs try to appease the SJWs. 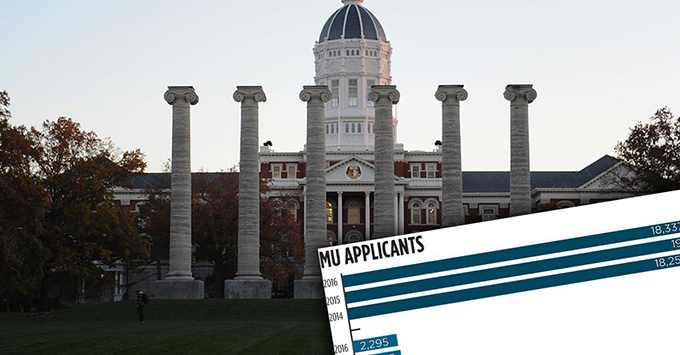 The University of Missouri (aka Mizzou) had numerous racial riots and protests last year, leading to a drop in the student base…a huge drop. They’re still reeling, still confused why parents don’t want to send their kids to a school with a reputation for violence and no reputation for education, and the “leaders” of the institution are still unable to come up with a plan to turn the school around. Granted, they’ve already gone off a cliff so I don’t think they can do much; I tried to explain how they might fix things, but the ideas I bring up repeatedly in my blog, such as integrity and scholarship, just don’t make sense to the folks that run the schools. The gentle reader might not understand how apocalyptic this is. Much like in the olden days where “company towns” screwed over the workers trapped in such towns (who were forced to pay exorbitant prices on rent, food, and other necessities), the big-big money in higher ed now is to trap students on campus, in pricey dorms. Such students have little choice but to spend those sweet student loan checks on campus services…believe you me, admin just lurves students who give all their money to the campus. Losing seven dorms full of students is a big hit to the bottom line. –check out that spiffy title, “Mizzou News Bureau associate director.” Guess what, Liz, your title is twice as long as your name. Good thing Mizzou doesn’t focus on education, or else you’d be gone, as per my guidelines for administrative positions in schools which care about education. Goodness, what a load of bull. “Flexibility whether the numbers are low or high”? Gee whiz, Liz, can’t you tell what the numbers are right now? Why can’t we hire people that can tell if numbers are low or high? I’ll help her out: if you’re closing dorms, the numbers are LOW. Gee, was that so hard? If the numbers are low, you should ask if you’re doing something to make the numbers low. I guess that’s why it’s so hard to tell if the numbers are low…it would lead to taking responsibility. Trouble is, until they admit responsibility, they can’t plan a course of action. The associate director said that despite the closures, the university plans to open a new 279-bed hall for the 2017-2018 school year. It takes years to construct a building on campus. Despite obvious trends of the last decade like online courses and changing demographics (our population is aging, which is as hard for our administrators to predict as determining whether the numbers are low, or high), our campuses, not just Mizzou, have been engaging in massive, huge, insane, building sprees. Even in states with years of falling on-campus enrollment, they’re still building and building and building. It’s easy to understand, as there’s huge capacity for corruption in construction; not every admin is satisfied with a splendiferous title and big salary, after all. So, Mizzou gets to be one of the first universities to see a building open up with no conceivable way to put anything in the building. Don’t worry, gentle reader, we’ll get to see lots and lots of this in the years to come. Of course, I don’t want to merely laugh as empty buildings get thrown up, I want to see some comeuppance, want to see the people responsible for this mess pay the price. It’s delusional to think any of the money that’s been stolen from the student loan scam will ever be clawed back, but…now that Mizzou is clearly suffering from the foolish choices of their foolish “leaders,” surely we’ll see something? Mizzou leaders have until April 28 to figure out how to make up for the university’s $20 million shortfall in the budget. Of the top 20 highest-paid employees, 16 are with the University of Missouri-Columbia, with Football Coach Gary Pinkel topping the list with $4.02 million in salary for the 2015-2016 school year. The sportsball coach alone could single-handedly make up 20% of the shortfall; about $13 million in Mizzou salaries comes from that top 20 list. Wanna bet any of these guys will pay for this disaster? Not a chance. You’ll see tuition raised, faculty let go, class sizes get larger even as enrollment drops…but I’ll let you know if any sanity will take place at Mizzou over this. Far more likely, the plundering will continue as usual.